World wide delivery with Tracking . Classic fantastic super mirror in real deal stainless steel. The guard does all the talking. Great with any knobs you choose. Polished to a very high mirror bling, non-magnetic stainless steel, 18% Chromium content, corrosion free. Edges rolled & polished. Mirror protected by an easy peel skin. PLEASE NOTE: It's a Super Mirror finish. Be aware that like any mirror surface under physical use, can & will develop very fine scratching from playing, less if using fingers. But stainless steel is more resilient than a plastic mirror guard which scratches easier & suffers clouding in the plastic. Steel still maintains a high mirror finish, and any fine marks through normal handling and playing are not so noticeable from a few paces away. After a lot of use, this guard can be re-polished back to a new mirror surface. 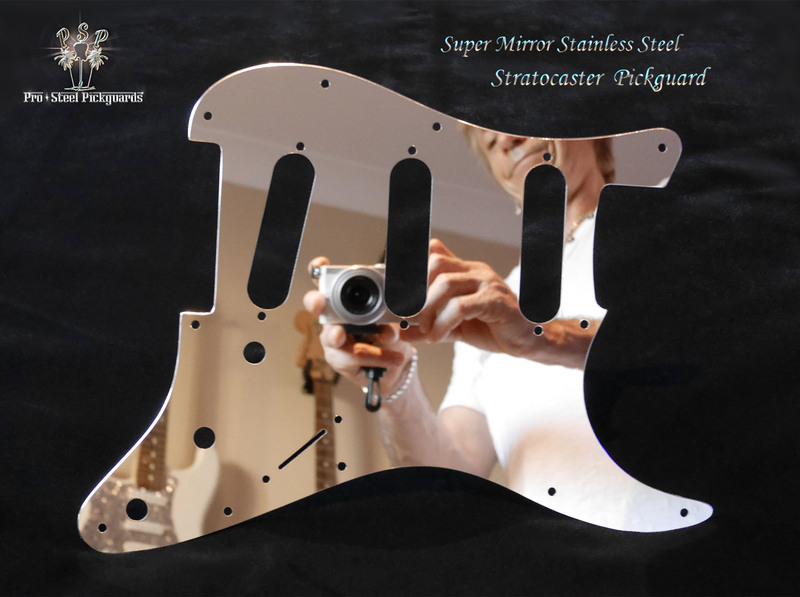 Pro-Steel are very careful with handling and preparation to get you the best Mirror Guard delivered. Mirror Stainless Steel - Made to Last. Light weight, very rigid, only 1.0 mm thick, weighs just near 2 plastic guards. The Super Mirror is now available for other Guards. Send us an email inquiry if you don't see your guard type. Stainless steel 304 grade non-magnetic. Thickness - 1.0 mm or 3/64"
Also works as a very effective noise shield. Your electronics will be more stable at higher volumes, and will not interfere with your original tone. In fact, these guards work very well on the best guitars for recording. Fits - Fits genuine Fender USA & MiM Strats from 1986 to present. Any Strat that a current Fender Strat guard fits. Squier Strats: Will fit current Squiers. If older than '86 there maybe 1 or 2 screw holes a little off center. That's usually no problem, the screws supplied will easily find a hole. If you need a hole for a Mini Toggle Switch let me know. I can do this free of charge.